For golf fans, it’s the first full week in April. For fans of the Oscars, it’s late February or early March. And for football fans, it’s early February. We’re talking about dates that devoted fans circle every year for the must-see events. Art fans circle early December for Art Basel Miami Beach, considered one of the world’s largest art shows. It’s an event for which SpeedPro Imaging, the nation’s leading printing and graphics franchise, was extremely proud to play a major role. The international art fair just wrapped up in South Florida. It showcased some of the world’s best contemporary art masterpieces by newly emerging and established artists. One of those established artists included Laurence Gartel, the “Father of Digital Art.” Eric Lazar, owner of the SpeedPro Chicago Loop location, established a magnificent relationship with the world-renowned artist. It’s collaborations and relationships, such as the one Lazar has with Gartel, that sets SpeedPro Imaging apart from other wide-format graphics providers. SpeedPro studio owners, like Lazar, don’t operate simply on a cookie cutter format. They take their craft seriously, and treat every assignment as a work of art. Gartel is a household name within the art industry. He was featured as the official artist of the 57th GRAMMY Awards in 2015 and the 113th New York International Auto Show in 2013. 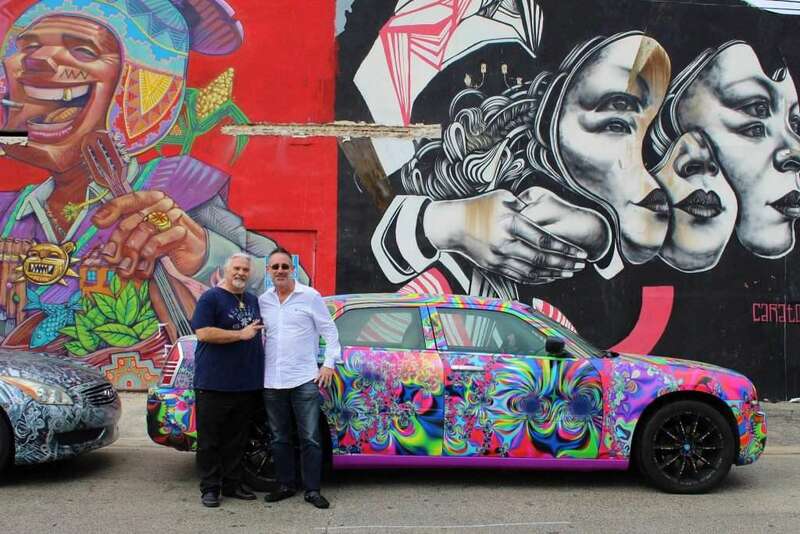 Over the course of Art Basel Miami Beach (December 4-10), he unveiled three stunning Art Cars – a psychedelic Chrysler 300, a digital inspired Infiniti G37 and a trippy, purple spiral fashioned Ford C-Max Hybrid. 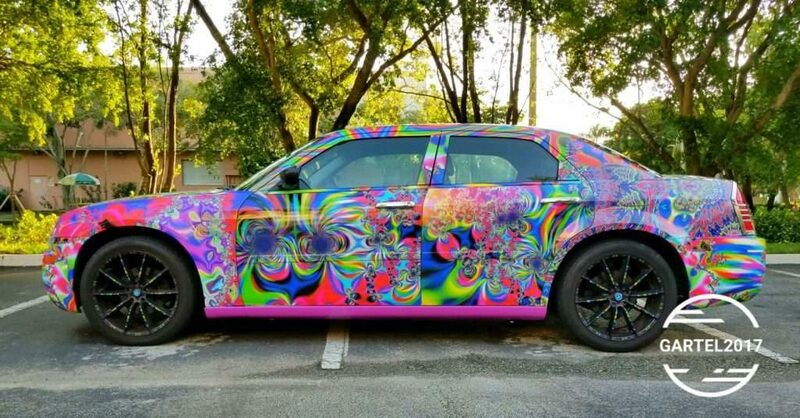 These Art Cars, which SpeedPro helped print and install, were featured as mobile exhibitions throughout the week, and will be making appearances at other art installations throughout the year. How did these collaborations between Gartel and SpeedPro Imaging Chicago Loop’s Lazar come about? Lazar was a big fan and he knew he could make Gartel’s grand vision a reality. Thanks to the nationwide network of SpeedPro studios, Lazar was able to pull the project off in Gartel’s Florida neighborhood with the help of SpeedPro Imaging Ft. Lauderdale owner Anita Pickens. Lazar and Pickens coordinated tirelessly to ensure the extensive printing was executed perfectly. The Art Cars are gorgeous examples of what all SpeedPro Imaging studio owners have in their repertoire. SpeedPro Imaging, the nation’s leading printing and graphics franchise, specializes in turning mobile advertising into pieces of art. Vehicle wraps are available to fit any need and budget. They provide a wonderful ROI. Full wraps cover an entire vehicle, delivering a dramatic message to anyone who sees it. SpeedPro Imaging also excels in bringing innovative ideas to life. Whether one is interested in tapping into the trend of moving art installations or interested in applying cutting-edge materials to story-high surfaces, SpeedPro prides itself on meeting any need. At SpeedPro Imaging, we’re advocates for artists because we consider ourselves artists. Our studio owners have won various accolades for their projects across America. Elevators, walls, windows, floors, tables and event tents are all blank canvases awaiting masterpieces. SpeedPro Imaging accepts the challenge to bring your imagination to life. You’ve seen what SpeedPro Imaging Chicago Loop Eric Lazar can do for world-renowned artist Laurence Gartel. SpeedPro Imaging is willing and ready to do the same for your vision. You can find the full pallet of our offerings when you visit speedpro.com, send an email or call us at (844) 274-4784.